We’re always told, “Expect the unexpected”. Does it really pay? For the people whose lives were uprooted in the 2016 Louisiana floods, whose futures were derailed, who still carry the scars of their commonly shared disaster, they KNEW to expect the unexpected. Many were able to flee in time and save a few things, including their lives. Some didn’t. But mostly everyone knew that expecting the unexpected would not shield them from it. Hope has its limits. But, when a partner comes lovingly by your side and says “WE can do this. TOGETHER”… that’s when hope can take wings. That was the privilege of this trip we got to take to Baton Rouge at the end of August. We were partners with an organization, Samaritan’s Purse, who has for years come alongside people in the midst of their anguish and despair, and for many, has helped prop their hope up back onto its own feet, with the help of individuals such as our team represented. Samaritan’s Purse staff showed us, some with fewer skill levels than others, and most of us in spite of our comfort zones, how to make a tangible difference in the lives of those to whom we were assigned for five days. We saw homes coming back to life and shared in the even more exciting anticipation of lives coming back to homes. We had the ultimate lesson in “Expect the unexpected”. Doing kind deeds for strangers, yes, that’s rewarding in its own way. But getting the unexpected joy of hearing the homeowner’s personal story, of triumph over despair, of their hearts being encouraged and strengthened, and even seeing them work alongside us in the daily grit and grime, was truly unexpected. Yes, it would be nice to see some gratitude at the end of the day. But the unexpected happened: we all became partners in their sadness, in their journey, and in the blossoming of their hopes. Together. Expecting the unexpected, well, maybe we should look forward to that. When we have partners like Samaritan’s Purse and other organizations that we as a company also get to be partners with, good things happen. 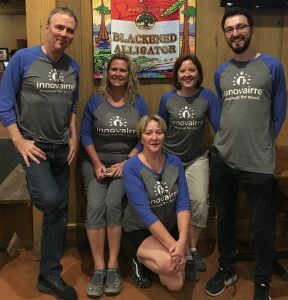 I’ve misunderstood my own company for seven years: Innovairre isn’t just a partner in fundraising, but in hope-raising, and even joy-raising.